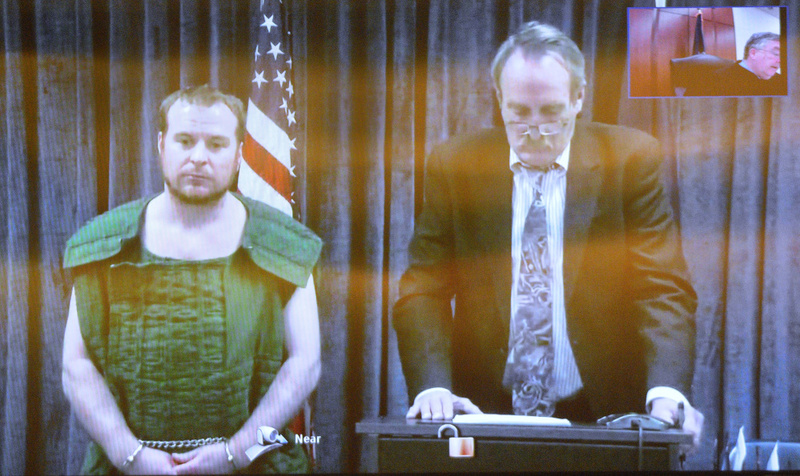 Jeremy A. Clement was arraigned on five related charges Thursday at the Capital Judicial Center. AUGUSTA — A Fairfield man responded “not guilty” five times Thursday when a judge asked for his pleas to charges related to the shooting of his ex-girlfriend in her mother’s home in Oakland. Jeremy A. Clement, 36, was arraigned at the Capital Judicial Center on a five-count indictment charging him with attempted murder, burglary, elevated aggravated assault, assault and possession of a firearm by a prohibited person. All the charges are dated April 19, the date police say Clement drove a four-wheeler to Roseanna Caret’s home in Oakland, kicked in the door, got into an altercation with her after asking to talk to her daughter, Jasmine Caret, and then shot Jasmine Caret in the shoulder. Clement was indicted in July and has remained in jail in lieu of $500,000 bail since the date of the alleged offenses, and that bail amount remains in place. At the arraignment, in front of Justice Donald Marden on Thursday, three Kennebec County sheriff’s deputies stood within 3 feet of Clement. Clement’s attorney, Walter McKee, said the defense was not ready to have a dispositional conference that had been scheduled for Thursday along with the arraignment. A new dispositional conference is now set for Dec. 7. Immediately after the hearing, which lasted less than five minutes, Jasmine Caret, who was in tears, left the courtroom followed by six others, including her mother, who had been sitting with her. They spoke briefly just outside the courtroom with the prosecutor, Assistant District Attorney Michael Madigan. In an interview shortly after the incident, Roseanna Caret said she and her daughter had a safety plan in case Clement arrived, because they knew him to be a violent man. Roseanna Caret had a baseball bat, which she used on Clement after he forced his way into the house. Jasmine Caret was wrestled to the ground by Clement, and Roseanna Caret reported she continued to hit Clement with the bat. Her daughter was shot in the shoulder with a .40-caliber pistol. Eventually, police arrived at the scene and used a stun gun to subdue Clement. Roseanna Caret is named in the indictment as the victim of the assault. She said she suffered cuts to her left cheek and the left side of her head, the latter of which required stitches. After the incident, Clement and Roseanna Caret were taken by Delta Ambulance to Thayer Center for Health in Waterville. Jasmine Caret was admitted to MaineGeneral Medical Center in Augusta with a bullet wound in her shoulder and a collapsed lung, according to her mother. At a prior court hearing, the prosecution said Clement has previous convictions for domestic violence assault, as well as another assault, violating a protection order, disorderly conduct and numerous driving violations, including operating under the influence and operating after habitual offender revocation, and a number of bail violations.